Show off your girl power with this Wonder Woman Movie - Wonder Woman Adult Costume. Includes Dress with attached shorts, Belt, Gauntlets, Armband, Boot Tops and Tiara. Lets catch up with amazing fighter of this universe, Diana the princess of Amazon. Superheroes theme party is coming up for you in this Halloween and we got an iconic Wonder Woman costume for you. Wonder Woman gained huge popularity over few years and became the strong feminist icon. Transform yourself in your favorite character with our ultimate costumes. Here comes the fashionista of this millennium. 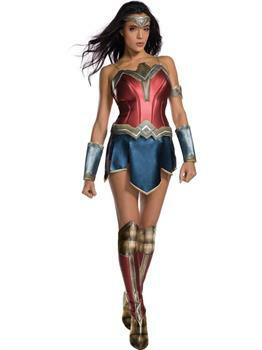 Your search for a perfect Halloween costume comes to an end with our Wonder Woman Movie - Wonder Woman Adult costume.